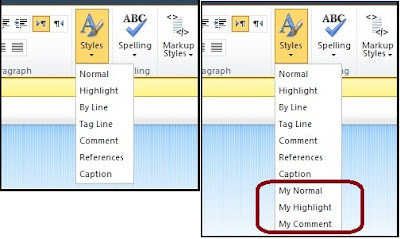 Styles and Markup Styles menus of SharePoint 2010 ribbon are populated dynamically by the client side code using Microsoft Ajax when we activate the Edit Mode of a page. Also they are populated based on the CSS styles that are available for the page. Write CSS classes whose names have the prefix ms-rteStyle-XXXXX. Here XXXXX distinguishes different styles. 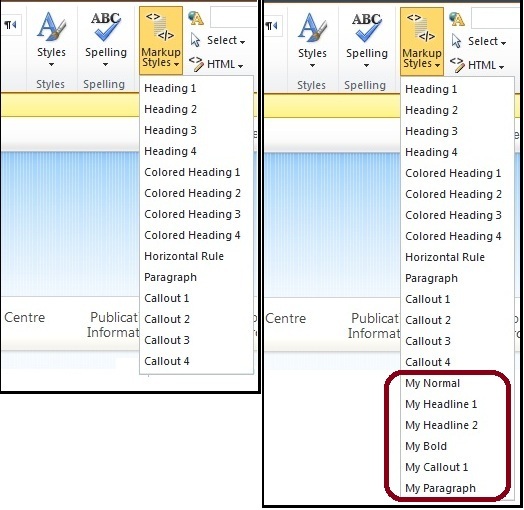 “-ms-name” specifies the display name of the class within the Styles menu. Selecting this item will apply the styles corresponding to this CSS class to the Rich Text Editor content. Write CSS classes whose names have the prefix ms-rteElement-XXXXX. 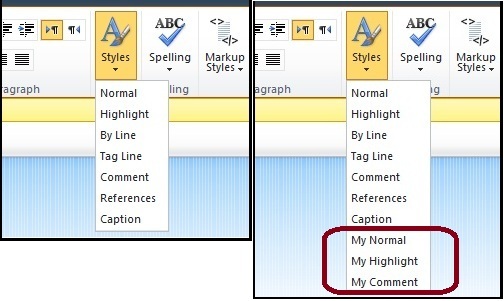 Here XXXXX distinguishes different markup styles. “-ms-name” specifies the display name of the class within the Markup Styles menu. Selecting this item will apply the styles corresponding to this CSS class to the Rich Text Editor content. In here by specifying a HTML tag in the front of the class name (Ex: H1.ms-rteElement-OMyHeadline1) will nest the content with that HTML tag. “My Headline 2” style will be applied in this way. Text content including the DIV element is nested within a H2 tag. Thank you!! This helped me a lot.